Background Etihad moved into Terminal 4 at the end of September, and the lounge décor and offering is almost an exact replica of that at the airline’s dedicated Terminal 3 in Abu Dhabi. 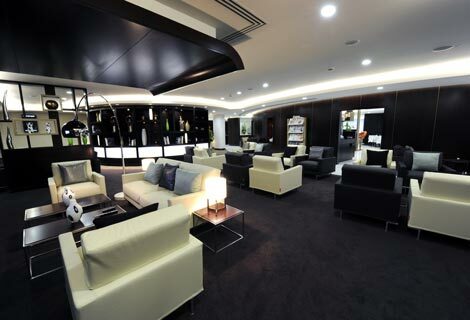 At Heathrow the lounge is for both business and first class passengers. The airline has three flights a day from Heathrow and when I visited after the morning flight had left, the lounge was already spick and span, ready for the next influx of passengers. Where is it? After security turn right and the lounge is on the right next to the Skyteam lounge. The Etihad lounge is tucked away down a white spiral staircase. What’s it like? This lounge is for both business and first class passengers but if it gets too busy the first class guests are moved into a quieter section. There is a VIP area, which can be accessed from a different entrance. The reception was staffed by two immaculate attendants when I arrived. There are no announcements in the lounge so the staff personally inform passengers when it is time to board. 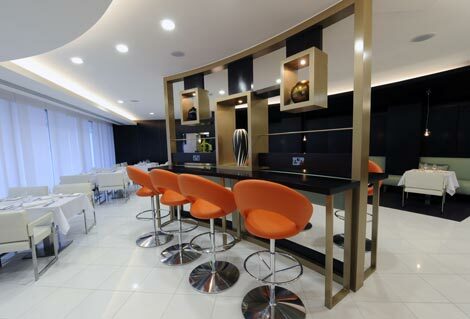 The design is simple but classy with the different areas creating a private and exclusive feel. There is a large wooden section of shelving curved around the a la carte restaurant area opposite a staffed bar. There are ornaments and artwork from the Middle East placed carefully around the lounge and the chairs and furnishings are all high quality leather and silk. There are plenty of different places to sit – in the restaurant, at the bar, in a comfortable chair or near the window (the blinds were drawn when I was there but otherwise there would be views over the runway), or in an area with relaxed chairs and footrests to lie back before the flight. Food and drink The restaurant had light snacks on the menu and my drinks order was taken while I decided. I had pitta bread with olives and some mozzarella and tomato salad. All the options looked light, and included roasted artichoke and sun-blushed tomato, smoked salmon and free range egg sandwiches on seeded rye, and samak quwarmah (a spicy white fish fillet) and more. Etihad serves food on demand in-flight. Facilities There’s a computer room with around half a dozen Apple Macs and the lounge has free wifi access. There are several showers and a prayer room for men and women and a prayer clock outside the room and at reception so that passengers lost in jetlag know when the next call to prayer is. There is also a soundproof kids’ room – in Abu Dhabi Etihad provides a nanny to keep an eye on the children, but this is not yet available at the Heathrow lounge. Spa The pièce de résistance is the Six Senses spa where you can book a free 15-minute facial or massage (back or foot). There are two therapists and small cosy treatment rooms. You feel as if you are a hundred miles from an airport when you enter this peaceful area. Passengers fill out a small form beforehand declaring any health issues and saying how they would like to feel after the experience. I had a very good intense back massage to realign my spine – the massage is done over your clothes so make sure you are wearing something thin and loose to get the full benefit. It’s a great idea and a must for anyone about to board a flight – afterwards I was given a hot beanbag to rest on my shoulders. Verdict The whole lounge feels as if you are in a high-end boutique hotel, with finishing touches including hand crafted mosaics on the washrooms walls in the spa (although in Abu Dhabi the tiles have 24 carat gold grouting) and the discreet yet efficient staff. It’s a peaceful place to settle down to work or relax before the flight and well worth arriving a little earlier for a spa treatment.